I wanted a hand bike attachment for my wheelchair and started talking to people I saw using different models. I met somebody who had a Team Hybrid Cougar so I looked you up on the web and came down and tried one out for myself, I made the decision to purchase one straight away. It has opened up new horizons for me. What I like about it is I can detach it and go into buildings, pubs, cafes and shops without too much hassle. Here are a couple of pix of my Cougar and myself. I’m at Topsham, a picturesque town on the River Exe Estuary between Exmouth and Exeter. 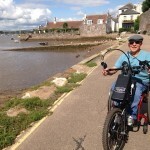 There is a fantastic bike trail all the way from Exeter to Exmouth about 25 miles round trip with great views, a couple of nice villages on the way with café and pub stops! 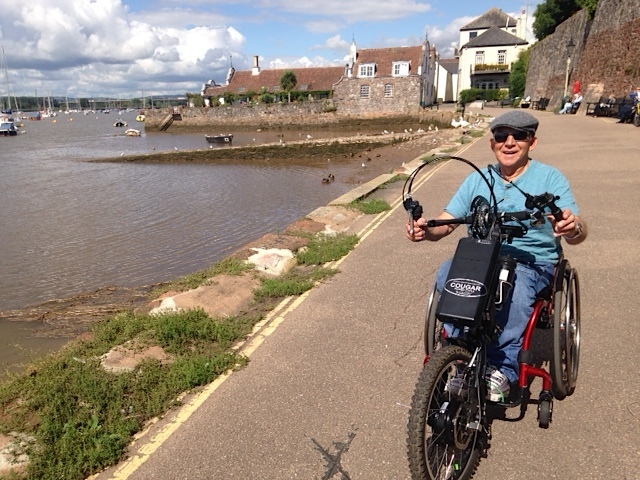 The Cougar handbike attachment has given me so much independence to explore all of the bike trails in Devon and further afield. I am hoping to go on a cycling tour next year to either Holland or France and cycle with a group of cyclists. As you are probably aware I was wounded in the Armed Forces and since recovering from my injuries have competed and enjoyed many sports over the years including competitive swimming, wheelchair basketball, road racing, skiing, scuba diving, canoeing and kayaking. 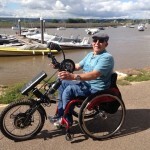 I did use a racing recumbent hand bike for many years but was finding the effort off getting in and out quite difficult as well as transporting it in my car also at the grand age of 69 the bones are starting to ache! The motor assistance with the gears on the Cougar mean I can easily keep up with able bodied friends and make easy work of hills and strong headwinds, also it is vey easy to transport to different locations. All in all it is making cycling a pleasure for me. I must have past so many kids and adults who say, “cool. I wish I had one”!